Dell’s Vostro V13 Notebook PC is an attempt to create the holy grail of portable computing – the inexpensive high-performance ultra-portable. It’s easy to make a small notebook; just look at all the netbooks out there. Then again, it’s just as simple for manufacturers to whip up a cheap notebook, but designing something compact and good looking that also has a degree of performance while keeping the cost down is a much taller order. The V13 is definitely a stylish notebook, with rugged brushed aluminium body and shiny zinc hinges that are nicely offset by black plastic front and back. The overall look is very much business chic as opposed to student flash or Mac restrained. At around 16mm thick, it’s a slim enough machine, but the 1.6kg weight is getting up there for an ultraportable, and although that’s light compared to a standard business notebook, it would be nice to see a unit this size coming in at closer to 1kg, let alone the 655 grams of Sony’s Vaio X113. In terms of specification, the V13 meets its business orientation reasonably well. The available 1.3 and 1.4GHz Core 2 Solo Low Voltage CPUs will outperform Netbook processors, but will lag behind the gruntier dual core units found in desktop replacements. There’s 2Gb of RAM installed (with support of up to 4Gb) and our review unit had a 7200rpm 320GB drive installed. 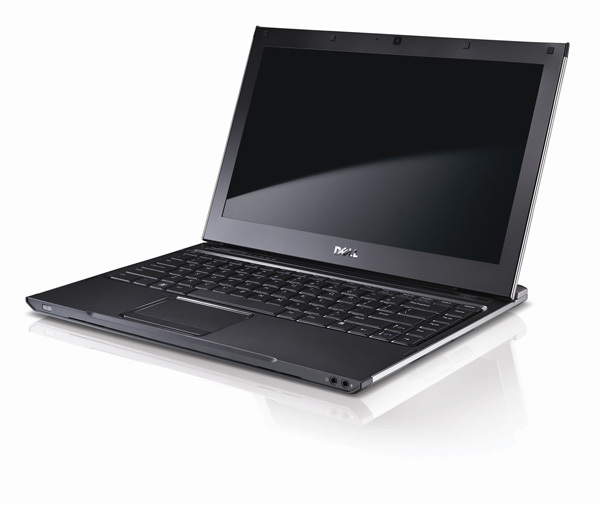 The 13.3-inch screen has accelerated graphics courtesy of Intel’s 4500MHD Graphics Media Accelerator. The V13 has a built in webcam, the expected Gigabit Ethernet port and 802.11b/g/n wireless, Bluetooth, mic/earphone sockets along with a 5-in-1 card reader and an Express Card slot. There’s one USB port and a shared USB/e-SATA port, which raises an ergonomic complaint. Which genius decided to place the USB ports on the back of the Vostro? Perhaps the guy was an Apple engineer moonlighting on a sabotage mission at Dell? Yes, I know this is a business machine but even business people tend to plug in USB keyboards, smartphones, iPods, flash drives and hard drives on a fairly regular basis, and having to root around the back every time is a pain. The second complaint is about the DVD drive. What DVD drive? Exactly! Yes, yes, again I know all about the Dell’s business notebook remit, but business users have occasion to need data from one of those silver discs. Stuff like client information, internal presentations, images and even a movie or three when on the road comes to mind, so the omission of an optical drive is highly annoying. I’m sure there are business users who’ll never even notice that there’s no DVD drive, but both of them are rather strange; the rest of us would be bugged by its absence on a regular basis. No, I don’t want to drag around an external DVD drive, thank you. Why buy an ultraportable only to carry a bag of accessories? 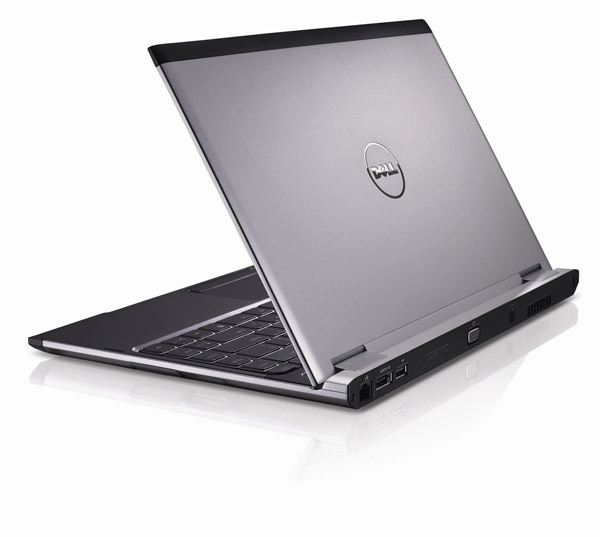 Now that the rants are over – back to the Dell’s performance and ease of use. It doesn’t do badly at all, actually. Windows 7 Pro is an effective Operating System and the Dell’s processor, while no speed freak, is more than capable of dealing with day to day computing tasks, including heavy duty multitasking. The screen is bright and quite sharp and the V13 is entirely happy with HD video as well, which is nice for travelers, assuming they can get said video files onto the hard drive in the first place. Don’t bother with 3D games, but that’s not the V13’s purpose in any event. The V13 runs cool, which means it runs quiet. Battery life was exceptional; after running for hours as part of a monitor group test I was doing, the Dell was still happily slogging along with around 40% battery remaining. I was quite sad to see the Dell leave. It was generally a pleasure to use, slim enough to cart around without too much grief, and robust enough that I didn’t feel that it had to be treated like a baby all the time. The speedy wake times and quick wireless network pick-up made for stress free browsing when I wanted something in a hurry. I genuinely missed the DVD drive though and found myself cursing every time I had to plug in a USB device, especially when I already had a the power and external monitor cables plugged in.